Today marks the first anniversary of a day no one in either side of my family will ever forget. 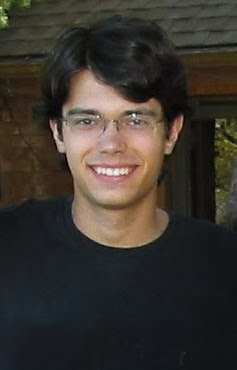 Early in the morning we received a call saying that my brother-in-law, Landon, had died while traveling home late at night. He had fallen asleep at the wheel. Jonathan and I were in Texas with my family at the time, as my dad was battling cancer and we weren't sure how much longer he would be with us. As it turns out, he died almost exactly one month later. To say that last spring was rough is a complete understatement. 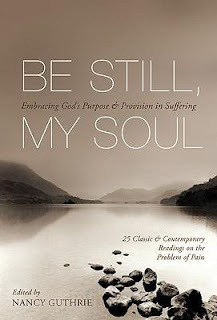 When I saw the book Be Still, My Soul : Embracing God's Purpose and Provision in Suffering was to be released by Crossway Books, I knew it was a book I wanted to spend a little time with, as we approached these significant anniversaries. 1. It is good for people who have walked in the valley of the shadow of death. 2. It is good for people who have not walked in death's shadow, but who need to learn how to comfort those who are. Note: I very specifically stated that those who have not walked with death need to learn how to comfort those who have. See, it's not an either/or kind of thing - it's a both/and. Knowing what to say to someone who is hurting is a difficult thing to be sure. But just because something is difficult, doesn't mean that we're supposed to shy away from it. We really have no excuse. 3. God's Provision in Suffering. It contains writings by the following people: Philip Yancey, R.C. Sproul, John Calvin, Dietrich Bonhoeffer, Abraham Kuyper, Martyn Lloyd-Jones, St. Augustine, J.I. Packer, John Piper and many other well-known Christians. It is an amazing collection of works which, combined, assure the reader that nothing happens by mistake or is outside of God's control. It comforts the reader, reminding them that God will supply all of their needs and is, in fact, working for their benefit. We are finite beings. We see only glimpses and moments in time. God is infinite. His gaze spans history and we can trust that His working plan is better than our own. One of the most amazing things said to Jonathan and I following the death of our family members was that, "This was a tragedy. God doesn't mean for things like this to happen." To rephrase that, "words of comfort" were used to say that God was all about making us happy and that Satan orchestrated these deaths and worked against us and our family by taking our loved ones away. To this I must say that such a statement is untrue! I know that they meant well but the statements were wrong. Landon died accidentally? God messed up? It was all a cosmic accident? The God I believe in is not sovereign enough to work His will in the world? That He was blinded by a momentary flash of light and failed to notice what was happening down below?! No. I don't think so. What happened last spring was no accident, neither was God inflicting His wrath on any of us. He was working for our good and for His glory, as painful as that is to realize and accept. If you read the story of Job in scripture we can see that God brought the matter of Job up to Satan. God allowed Job to suffer difficulties. Why? We can ask that question but it doesn't change the answer: God is good. All of the time. He is never evil. While Satan certainly meant what befell Job to be evil, God did not. "I am especially concerned when events are described as a "senseless tragedy." If we look closely at the phrase, it becomes obvious that "senseless tragedy" is an oxymoron. It is a self-contradictory statement, a phrase that makes no sense. For something to be defined as "tragic" there must first be some standard of good for it to be tragic over against. But if things happen in a way that is "senseless," there cannot be anything that is either a tragedy or a blessing. Each event would simply be meaningless. To question God? I don't think that is in my best interest. The point of suffering is to strip us of our sins, to draw us closer to Christ, to remind us that life is precious and brief and to focus on eyes on God and on Heaven. Heaven then will be the place without question marks, tears or pain. For now we kind of have to walk in faith a bit. But to walk away from faith in God's ability to be sovereign is not in the least bit attractive and so I must reject the statements that any pain I suffer is a cosmic accident. He is good. He is gracious. He is kind. He is merciful to us on our tearful and darkest nights. He is in the pain. He is around the pain. He carries us through the pain. There is not one emotion that I have felt that Jesus didn't experience in human flesh. He knows my family's pain. He knows our sorrows. But His vision extends further than mine/ ours and He sees what we cannot see - a perfect future. We walk by faith. We say, "It is well with my soul" because we believe in His sovereignty and in His perfect plan. Though we cannot always understand, He also doesn't expect us to. Faith. Hope. Love. All of these things - HE IS. Could I recommend this book? In less than a heartbeat. Its truths are sure. Bad things happens. God knows and allowed them to happen. But He also stands ready to comfort us and will even listen to our questions. But just because we have questions, doesn't mean He is required to answer them all. Not here. Not now. No matter how hard we might feel like stomping our feet or how loud we might feel like screaming. The good news is, He doesn't expect us to recover in a day. He knows we are incapable of doing so. Therefore He promises never to leave us or forsake us - not in one day, or three hundred and sixty-five days, or a thousand! He is still here with us. And He is still good. It's hard to believe that it's been a year (and I know even harder for you and your family!) Thinking of you and Jonathan today. Wow...it's already been a year? I'm so happy to see that you and Jonathan have been able to draw closer to God through this, Carrie, and that you're not bitter or resentful towards His plans. Be strong in the Lord and in the power of His might. God be with you and yours today. First anniversaries of the loss of a loved ones are the hardest, I think, though they're never easy. I've read a couple of Nancy's other compilations for Christmas and Easter and loved them, This looks like an excellent resource as well. I'm going to go out it on my wish list. I have heard even well-meaning doctrinally correct in other ways Christians say some absurd things about suffering or seem to believe and every good circumstance comes from God and every bad one from Satan. I think they have overlooked a few passages in the Bible where God speaks of things He has done or will do. But we can trust in His character and purpose and love in whatever He does or allows. Fantastic thoughts and will definitely add this to my growing Amazon order. Love to you all! Wow... It seems like it was only a couple months ago. I think about your family every time I see our neighbor's son, his name is also Landon. I pray for you all -- am pryaing especially at this time for you and your family (and extended family). Praise the Lord that Landon is with Jesus and one day you'll all be together again. What hope we have in that! A year? Wow! I'll be praying for you during this month. You share beautifully and bless others in the telling. I must read that book, too. A very moving review. This is an issue that causes the most staunch believer to wrestle with the why's, what if's, etc. Sounds like an excellent read. I didn't realize it had been a year. I know that you will continue to grieve but I'm thankful for your testimony that you do not grieve as those who have no hope! What hope we have in Christ, our living hope! Christ in us, the hope of glory!